Wichita weather can sometimes be unpredictable as March rolls in like a lion and out like a lamb, but everyone always hopes for beautiful blue skies and lovely temperatures. Spring in Kansas is usually gorgeous, with temperatures ranging from 48-58 degrees. 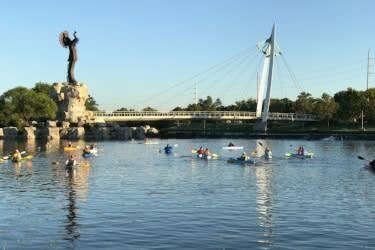 It makes for the perfect time to get outside and enjoy Wichita’s outdoor activities. We’ve put together a list of five top outdoor options for you and the whole family that are within walking distance of INTRUST Bank Arena, home of the first and second rounds of the 2018 NCAA Men’s Basketball Championship coming in March. Test out these spots ahead of the big game, or plan to take the family on an outdoor excursion or picnic while you’re here this spring. Wichita has many nicknames, one of which is “River City,” because the Big and Little Arkansas rivers flow right through the middle of town. Wrapping around its shores are miles of walking and jogging paths, museums and opportunities to get out on the river. Rent a bicycle through Bike Share ICT to explore the trails along the river, or ride to several of the museums nestled along the banks. Simply download the Bike Share ICT application on your phone, choose your rental package and take off. 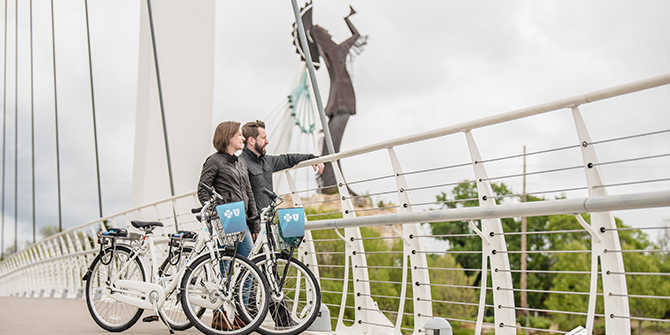 There are 100 bicycles and 19 stations around downtown Wichita. Rent the bikes for only $3 an hour, or get a yearly membership for $30. When you travel along the Arkansas, don’t forget to stop by the most iconic monument in Wichita, the Keeper of the Plains. Wichitan and Native American artist Blackbear Bosin built this 44-foot-tall sculpture in 1974. The land between the two rivers is sacred to the Native American people. The 5-ton statue sits 30 feet higher on a pedestal overlooking the city. Don’t miss the Ring of Fire, a lighting of fire pots at the base of the Keeper. As long as weather allows, these large pots will be lit to complete the circle of the elements: earth, air, water and fire. The ceremony takes place at 9 p.m. from March 8-Oct. 31 and 7 p.m. from Nov. 1-March 7. The pots burn for 15 minutes. 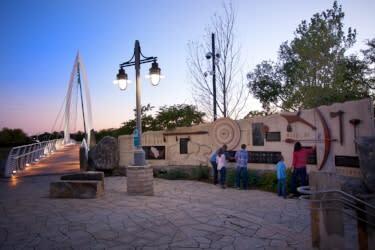 While you’re there, be sure to admire the art and outdoor exhibit at the Keeper of the Plains Plaza. Visit the Keeper by crossing the pedestrian suspension bridges from the intersection of West Central Avenue and Nims or near Exploration Place on McLean Boulevard. Visit the Mid-America All-Indian Center to learn more about the native people of Wichita and the Plains, plus experience an outdoor learning center, medicine garden and full-sized teepee. If you’d like to take a float trip down the Arkansas River, you can do so by renting a paddleboard through the group SUP Wichita, which is known for its stand-up paddleboard yoga classes. Wichita Rental also offers guests the chance to rent boats, paddleboards, and kayaks. How about an impromptu picnic-like lunch in the middle of downtown Wichita? 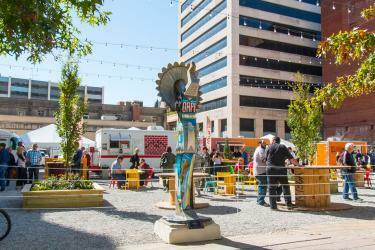 Hop on the Q-Line Trolley and head to the ICT Pop-Up Urban Park and catch the rally of food trucks parked between two buildings along Douglas Avenue. Equipped with tables and chairs, table tennis and an ever-changing surrounding, this is one spot in Wichita you won’t want to skip. The food truck schedule changes during lunchtime every Monday-Friday, but there is a type of food for everyone. Grab your family and friends and experience the relaxed atmosphere of the Pop-Up Park, and take selfies with the multiple Keeper of the Plains statues. Don’t forget to answer the chalk talk question on the wall and leave your mark on this urban development. Each weekday from 11 a.m. – 1:30 p.m., at least three different food trucks line up along the park side to serve lunch. Enjoy Asian tacos at The Kamayan Truck, have a sweet or tangy treat at LoLo’s Crepes, sit and eat in the double-decker Kind Kravings bus or try the truffle fries at The Flying Stove. No matter what you’re into, the diversity in Wichita food trucks will deliver. As you explore downtown Wichita, you’ll notice many businesses are adorned with murals representing ICT pride. You’ve certainly seen the Wichita flag by now and can recognize the symbol painted on storefronts, the side of buildings, billboards, trashcans, overpasses and other random places throughout the city. 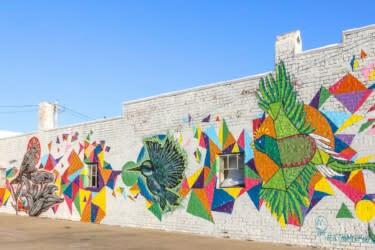 Take the family on an Urban Art Tour, exploring the different kinds of free art exhibitions popping up around Wichita. From 31 bronze sculptures along Douglas Avenue to dozens of murals and paintings throughout downtown, Wichita artists are inspiring perfect selfie-spots. How many can you find? Take our Mural Tour or count how many miniature versions of the Keeper of the Plains you can find as you walk through the shops and restaurants of downtown Wichita with the family. Take the kids on a trip to a magical place where fairies dance and tree monsters are nothing to be afraid of as they explore the Downing Children’s Garden at Botanica Wichita. 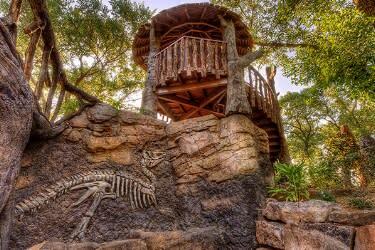 This educational, interactive environment allows families to enjoy, discover and appreciate the natural world. From exploring giant bugs to climbing through carved trees with faces and limbs, kids follow a journey through their own imagination. The Downing Children’s Garden is suited for all ages. With more than 30 gardens to choose from, spend the day exploring greenery, walking through the butterfly house, experiencing the Shakespeare Garden or learning about Wichita’s sister city, Kaifeng, China, in the Chinese Garden of Friendship. Take a walk through the forest on a ¼-mile trail winding through an existing nature area or head to the Woodland Bird Garden, a natural habitat with more than 300 newly-planted trees perfect for local birdlife. Witness a piece of history as you see portions of Wichita’s former Joyland amusement park at Botanica Wichita. Joyland was a theme park in Wichita that operated for nearly 60 years until its doors closed permanently in 2004. One of the most iconic pieces of that park – an Allan Herschell carousel – was saved and donated to Botanica in May 2014. Botanica is currently working to raise funds to restore the carousel into a special pavilion on its property. There are only three carousels like this one left in the world, meaning Botanica will be home to one of the rarest collections in history. Wichita is one of best cities to play golf with five public courses, several private and semi-private golf courses, and access to both disc golf and foot golf. Traditional golfers will love the Arthur B. Sim Golf Course nestled along a curve in the Arkansas River, not far from the Keeper of the Plains. Players get a peaceful course with a beautiful city backdrop. This course is great for all skill levels of golfers, featuring a straightforward layout, tree-lined fairways, and well-bunkered greens. 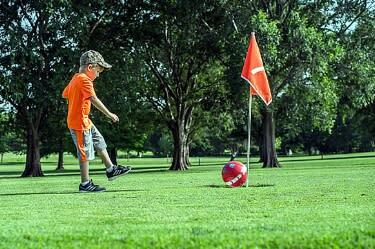 Oak Park is one of the most popular places people love to play disc golf. Located in the bend of the Little Arkansas River, this downtown hot spot offers an 18-hole disc golf course sitting at 5,322-feet long and begins at par 58. Disc golf is a sport similar to traditional golf, except players shoot holes with round discs into baskets that serve as holes. All disc golf courses in Wichita require players to bring their own equipment, but you can purchase items just north of Oak Park at Ducks Flying Discs to get you started.